The R&S CMX500 based test setup provides a 5G network simulation to test a mobile phone in real-time using a signaling connection. 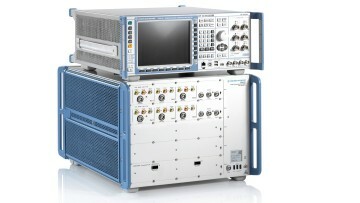 Test and measurement expert Rohde & Schwarz and electronics manufacturer OPPO have performed a non-standalone 5G NR FR1 signaling test. The OPPO 5G smartphone was powered by the Qualcomm® Snapdragon™ X50 5G modem and RF frontend solutions. The test was carried out using an R&S CMW500 wideband radio communication tester and the new R&S CMX500 5G NR signaling tester from Rohde & Schwarz. The R&S CMX500 based test setup provides a 5G network simulation to test a mobile phone in real-time using a signaling connection. This connection was used during the test to verify the protocol stack implementation of the OPPO mobile phone. In addition, the R&S CMW500 adds LTE-Advanced-Pro features, such as the support of five-component carrier (5CC) and 4x4 MIMO. Xu Ming, responsible for product development system at OPPO VP, said, "OPPO and Rohde & Schwarz have a long-term and in-depth cooperation in the development and production of mobile phones. This cooperation has played a very important role in improving the communication experience with OPPO devices. We hope that we work hand in hand with Rohde & Schwarz in the 5G era to bring a better communication experience to users." Anton Messmer, Vice President Mobile Radio Testers at Rohde & Schwarz, said: "We are very happy for having carried out a successful 5G NR signaling test with OPPO. This event marks a new milestone, inspiring further development of 5G test cases with OPPO and other valued partners in the industry." OPPO is a leading global smart device brand. For the last 10 years, OPPO has been focusing on manufacturing camera phones, while innovating mobile photography technology breakthroughs. OPPO started the era of selfie beautification, and was the first brand to launch smartphones with 5MP and 16MP front cameras. OPPO was also the first brand to introduce the motorized rotating camera, the Ultra HD feature and the 5x Dual Camera Zoom technology. In 2017, OPPO was ranked as the number 4 smartphone brand globally, according to IDC. And today, OPPO provides excellent smartphone photography experiences to over 200 million young people around the world. OPPO operates in more than 40 countries and regions, with 6 research institutes and 4 R&D centers worldwide and an international design center in London, OPPO’s more than 40,000 employees are dedicated to creating a better life for customers around the world. Qualcomm® and Snapdragon™ are trademarks of Qualcomm Incorporated, registered in the United States and other countries. Qualcomm® Snapdragon™ is a product of Qualcomm Technologies, Inc. and/or its subsidiaries. The Bluetooth® word mark and logos are registered trademarks owned by the BluetoothSIG, Inc. and any use of such marks is under license. Other trademarks and trade names are those of their respective owners.